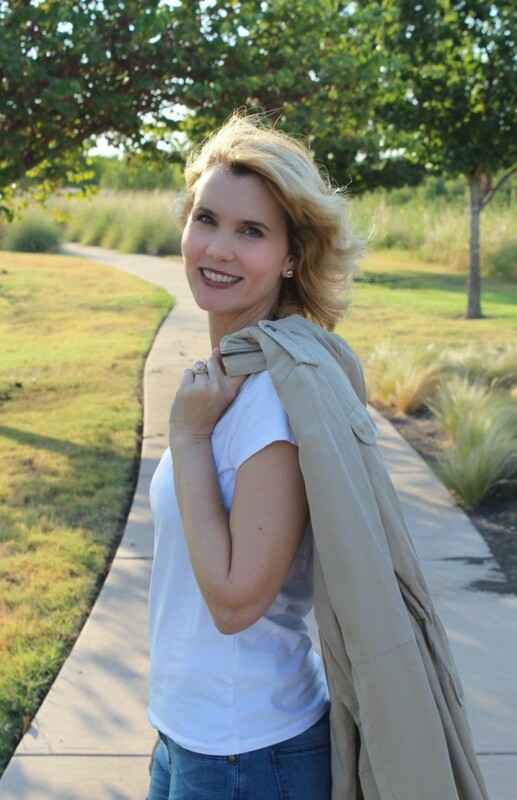 Fall fashion is one of my favorite topics to talk about. From the boots and the outerwear, to the denim and heavier jewelry, it’s a fun time to up your fashion game. I like to be able to walk into my closet and put together an outfit in a minute or less. How do I do that? By having a few key pieces as my go-to’s and adding on to them. Today I’m sharing with you my fall favorites I feel are key pieces for your fall wardrobe. Here’s my list of 5 key pieces for your fall wardrobe and I’m wearing all of them! All of these pieces can help create a number of different fall outfits. For this outfit, I could change up the shirt and wear a patterned button up. Or if the weather is cooler, I could add a scarf. I could trade out the booties for flats or tall boots. Even a pair of my favorite sneakers would look just perfect. I wear a basic white tee under sweaters, cardigan, blazers and jackets and these peep toe booties go well with denim and skirts. These fall key pieces make putting outfits together for fall easy and quick if I need to get dressed in a hurry. 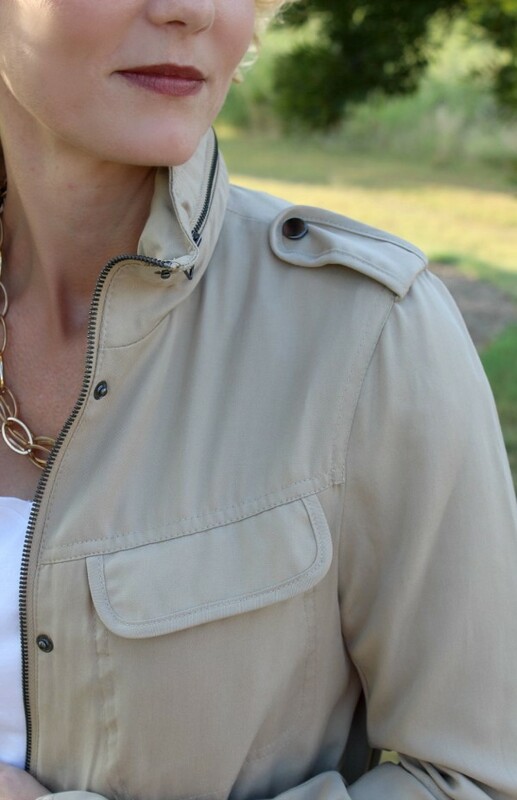 How gorgeous is this Isaac Mizrahi anorak? The minute it arrived at my doorstep I tried it on. The minute I tried it on, I received some ooohs and ahhhs from my family. It’s one of those articles of clothing that you put on and you feel like it was designed just for you. It is so well made and has details that really makes it stand out. You might think an anorak is best for spring (and it is great for spring! 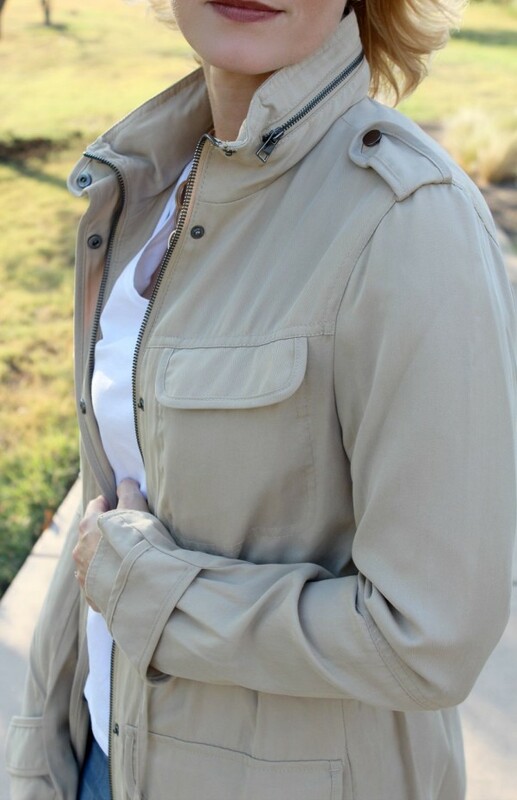 ), but it’s also one of my go-to pieces for fall because of the unpredictable weather here in Texas. The forecast for September? Wet, yet still warm. 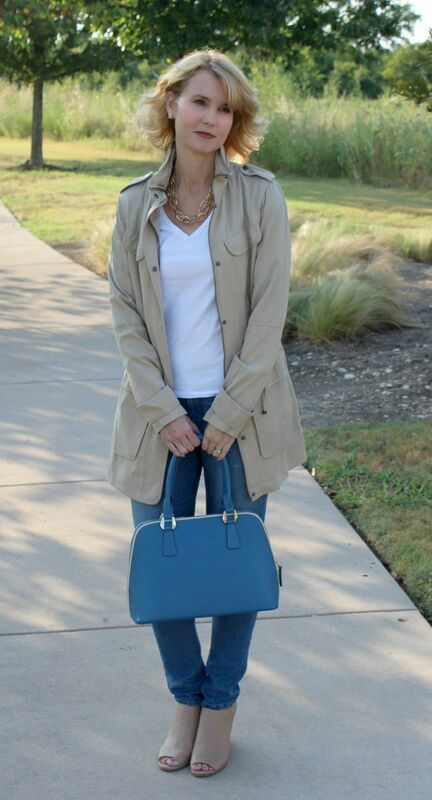 This anorak is the perfect weight for September Texas temperatures. If I wanted to wear this zipped up, the waist tie would give me some definition in my waist. When it comes to my denim, I am very (very) picky. I have curves and I need a pair of jeans that gets that about my body. The Savanna Skinny Jean from Isaac Mizrahi seems to personally understand that hey, woman have curves! This is the skinny jean for every shape and size because of the perfect amount of stretch it has. It hugs your curves, yet holds its shape – two very important features to me. The vintage wash looks fantastic with just about every top. Now it’s your turn – what are some of your go-to pieces for fall? *Mom Fabulous received samples in order to facilitate this post. All opinions are 100% mine. I love all of these pieces!!! So cute together, and they will go with so many other things too. 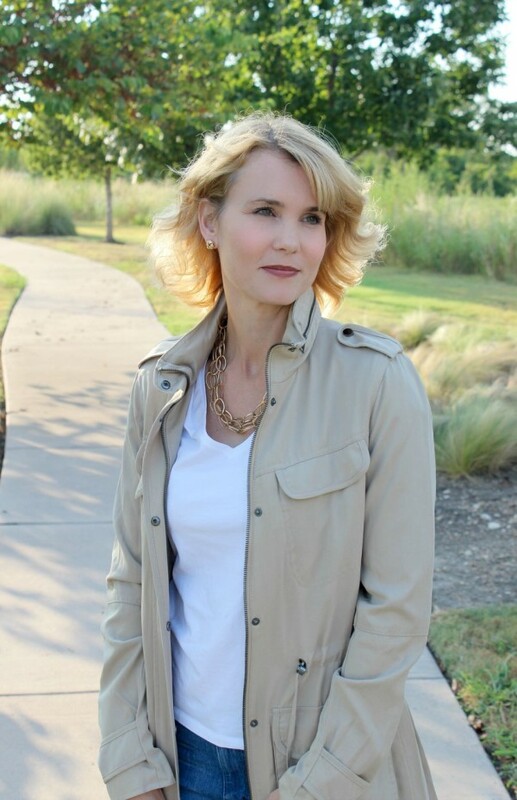 I love all these pieces but that jacket… SWOON and the shoes are fabulous too! It’s gorgeous right?! The fit is amazing as well. Great picks! I need to get myself some great peep toe booties. I love your lightweight jacket too!! Thank you Shannon! I wear those peep toes with everything during the fall. Love them! Gorgeous Julie, I love how such basics come together and look so gorgeous together. Makes me want every single piece you have on. I am SO ready for fall! J’adore that bag!